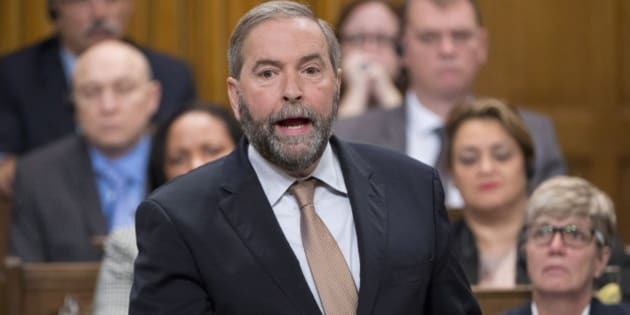 NDP Leader Thomas Mulcair told the House of Commons Friday that Canada should not "rush into war" with airstrikes against the Islamic State of Iraq and the Levant. Mulcair said Prime Minister Stephen Harper has not answered enough questions about the mission. There is no more important decision that we make in the House, no more sacred trust for a Prime Minister, than sending young Canadian women and men to fight and risk making the ultimate sacrifice in a foreign war. The Prime Minister is asking for the support of Parliament. He is asking for Canadians' support, but the Prime Minister has refused to answer their questions. Let me quote the Prime Minister. He stated: "Mr. Speaker, as you can understand, I neither have the will nor the desire to get into detailed discussions of military operations here." He said neither the will nor the desire. "Here" was this Parliament, and it was not just about the "details". The Prime Minister has not outlined a broad strategic blueprint for the mission. He cannot even answer basic questions about the breadth or cost of Canada's military deployment. When did Canadian Forces arrive in Iraq and how many? No answer. What contribution have our American allies requested? There was no answer. How much will this mission cost? What are the rules of engagement? What is our exit strategy? There was no answer, no answer, no answer. These are not hypothetical questions. The only ally of the Prime Minister's plan to begin a 30-day mission in Iraq was the Liberal Party, even though there was not a shadow of a doubt that it would lead us exactly where we are today. But now that Canadian troops are committed, Conservatives are telling us the mission will be expanded to air strikes, refuelling capabilities, aerial surveillance. Now the Prime Minister is specifically opening the door to bombing in Syria—from mission creep to mission leap. The United States has been in this conflict for over 10 years. It has been fighting ISIS under one name or another for over 10 years. While ISIS has renamed itself several times since 2004, al Qaeda in Iraq, Mujahideen Shura Council, the Islamic State of Iraq and al-Sham, Syria, it is literally the same insurgent group that U.S. forces have been battling for over a decade. Even the Minister of Foreign Affairs, in a moment of rare candour for the Conservative government, admitted that there are no quick fixes in Iraq. He called the fight against ISIS and groups like it "...the struggle of our generation". That may well prove to be an understatement. In one of the Prime Minister's few real answers about this mission, he said that Canada would be in Iraq until ISIS no longer has the capability to launch attacks in Iraq, Syria or anywhere else. Now he claims it will be only six months. It cannot be both. The defeat of the insurgency in Iraq is a goal that the United States has been trying, without success, to achieve since the wrong-headed invasion of 2003. All of the horrors unfolding before our eyes are as a result of that failed mission. Remember, back in 2003, it was the current Prime Minister, at the time leader of the opposition, who went to the Americans to berate the Canadian government for not getting involved in what he considered a just and noble cause. Their nostalgia is such that his immigration minister during the emergency debate in this House just a few days ago actually dusted off the canard of weapons of mass destruction to try to justify this war. The Prime Minister insists that this mission in Iraq will not be allowed to become a quagmire, but is that not precisely what our American allies have been facing in Iraq for the last 10 years? Will Canada be stuck a decade from now mired in a war we wisely avoided entering a decade ago? Do we have a plan for the war? Do we have a plan for the thousands or tens of thousands of veterans for whom we have the sacred responsibility to fully support in years after? It is not only New Democrats who feel these questions have not been answered, and here a few examples. In the Globe and Mail: "The case for Canada to go to war in Iraq has not been made". In a Toronto Star editorial: "[The Prime Minister] fails to make the case for Canadian combat role in Iraq". There are dozens of editorials and opinions like that across our country. Why is military action supposedly our only choice in Iraq when it is not even considered elsewhere? ISIS has thrived in Iraq and Syria precisely because those countries lack stable, well-functioning governments capable of maintaining peace and security within their own borders. Canada's first contribution should be to use every diplomatic, humanitarian and financial resource at our disposal to respond to the overwhelming human tragedy unfolding on the ground and strengthen political institutions in both those countries. With the well-deserved credibility Canada earned by rejecting the initial ill-advised invasion of Iraq, we are in a position to take on that task. However, the tragedy in Iraq and Syria will not end with another western-led invasion in that region. It will end by helping the people of Iraq and Syria to build the political institution and security capabilities they need to oppose these threats themselves. Canada, for our part, should not rush into this war.